The MOMO XL One is the top specification suit from MOMO. It includes three layers of top quality nomex material, for extra protection. 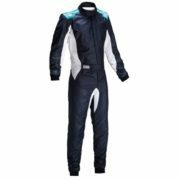 The racesuit is made from a lightweight material, ensuring that even hot drivers remain cool. The suit is available in black or white and includes contrasting cuffs adding a little style. The suit includes HANS compatible epaulets and is approved to the most recent FIA specifications. You can carry this MOMO suit to the circuit with the included carry case.